The Bronx Institute’s ENLACE (Engaging Latino Communities for Education) program, which is based at Lehman College, was recently awarded two new grants—$50,000 from the Edwin Gould Foundation and $25,000 from Con Edison—to help in its work during the 2018-2019 school year in preparing high-potential students in STEM (Science, Technology, Engineering and Mathematics) topics. 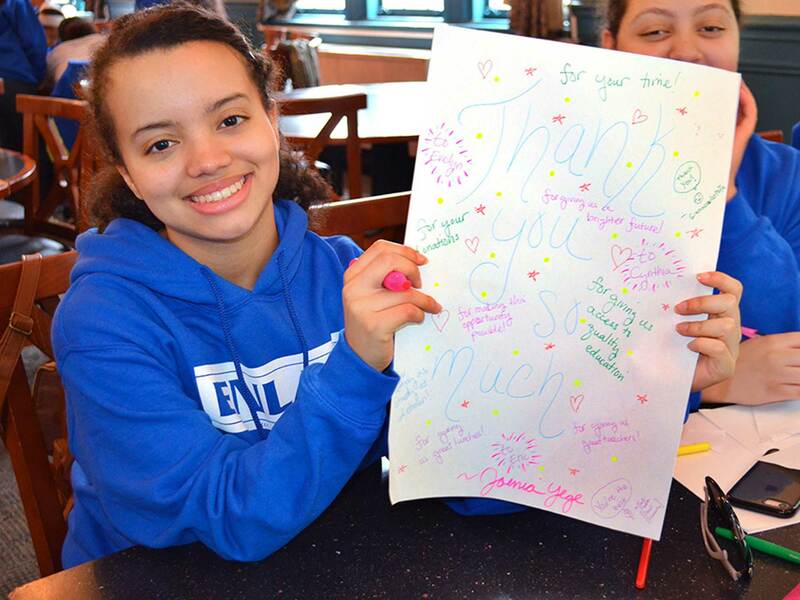 To show their appreciation, a few dozen ENLACE students held a ‘thank you’ assembly and worked together to craft notecards and posters in gratitude to the two funders for their generosity and continued support for the program. Several parents of ENLACE students also took part in the assembly to show their appreciation to the Edwin Gould Foundation, Con Ed and the academic staff members. One parent of an ENLACE student at the assembly remarked, "We love the program not only because of the instruction, but because of the friendships and connections that are formed among the teachers, students and administrators of ENLACE. My daughter will carry those friendships with her forever." ENLACE works to ensure that students graduate from high school with honors and NY State Regents diplomas and then readies them for success in their postsecondary studies. Besides supplemental instruction in STEM subjects, the students, who are mostly in grades 8 through 10, are given critical writing and thinking skills. The hope is that these students will aspire to careers and leadership positions in which young Latinos are traditionally underrepresented. Dr. Herminio Martinez, executive director of the Bronx Institute, expressed his own appreciation for the grants, and added, "We could not possibly continue this work without the resources provided by Con Edison and The Edwin Gould Foundation. Their generous contributions will have a profound effect on the future well-being of our students."